Oftentimes, the word "cruise" brings to mind visions of veritable cities on the sea, where thousands and thousands of tourists crowd onto a ship and flock into ports so that they can see bits and pieces of a place then return to the perceived comfort of feeling like they never left home. Cruises are not immersive, they are not intimate, they do not allow you to experience the local culture in any truly meaningful way... But Windstar Cruises are not like this. Windstar understands all of the inherent problems with large cruise ships and has found a way to provide just what those do not. The luxury small cruise ships never hold more than around 200 guests, the excursions and activities and cuisine are all organized around the local culture, and the crew the guest ratio is an impressive almost 1:1. The small size of the ships also allows them to travel into smaller ports and tiny harbors that a larger ship could not access. I went on my first Windstar cruise in January of 2016 to French Polynesia (Tahiti and Bora Bora and the surrounding islands) and it was such an incredible experience. This time, the cruise was from Lisbon to Barcelona, through the Atlantic and Mediterranean. We stopped at so many interesting ports along the way and got such a great taste of the coastal beauty of southern Portugal and Spain. We decided not to do an excursion in Lisbon since we had already arrived a day before, so we just explored on our own as well as took a very fun tuk tuk tour around the main sites. Lisbon was a beautiful albeit very hilly city, like a European version of San Francisco (complete with a matching Golden Gate Bridge and all). My favorite gem was the Monastero di São Vicente de Fora, where in addition to the one of the largest collections of azulejos (blue tiles) in the world on display in the monastery, you can climb the belltower for an impressive view over the entire city. Our next stop was Portimao, in the Algarve region on the Southern coast of Portugal. We had already stopped in the Algarve on our way to Lisbon from Madrid, so it was then that we did an amazing boat tour of the infamous sea caves in the area. So for this stop, instead of choosing another boat tour excursion, we opted for a wine tour. We drove out to a great winery and after a tour of the property were able to taste several of the wines. We wound up buying several to take with us, as well, and drank those over the course of the week. It was on this excursion that we befriended a group of people that we wound up hanging out with the rest of the trip. That's one of the best parts of these small ships--it is so easy to get to know the other people on board. Like the Algarve, we had already stopped in Seville on our drive to Lisbon, but there was still so much more to see. We headed straight for the Cathdral de Seville and waited in the hot sun to get inside. The day we were there was one of the hottest days of the year, reaching a ridiculous 110 degrees. We had to take it easy and stick to the shade, ducking into air conditioned shops and cafes whenever possible. After walking through the Cathedral, which is one of the most opulent Gothic cathedrals I have ever seen, we made our way to the Casa de Pilatos, a gorgeous little villa with Moorish style architecture and lovely little gardens. Next, we walked to the Metropol Parasol and, silly us, got there right around the hottest time of the day. We took the elevator up to the viewpoint but it was so sweltering hot that we barely spent any time taking in the view of the city. We then took it easy the rest of the afternoon, shopping and eating a long lunch. Our next day, we arrived late in the day to Gibraltar, a place that I knew very little about save for the infamous name "The Rock of Gibraltar." I learned a lot during our tour of the rock, including the fact that it is a British territory and is the third most densely populated country on earth. The site is significant because it overlooks the narrow Straight of Gibraltar, the entrance into the Mediterranean from the Atlantic Ocean and one of the busiest trade routes in the world. The day we were there was very foggy but on a clear day you can see Africa across the water. When in Málaga, we chose to do another wine tasting excursion, this one to the adorable town Mijas. Unfortunately it was another very foggy day, so we couldn't see much of the view, but the town itself was adorable. We had some free time during which we walked into some of the local shops and I wound up buying the souvenir I had been wanting the whole trip, a set of hand-painted dining ware for my new apartment. The wine tasting was lovely, then we headed back to Málaga, where we had some more free time to explore there, though it was much less cute and more industrial than I would have liked. The most strenuous excursion was the one to the Alhambra in Granada, if only for the long bus rides there and back. 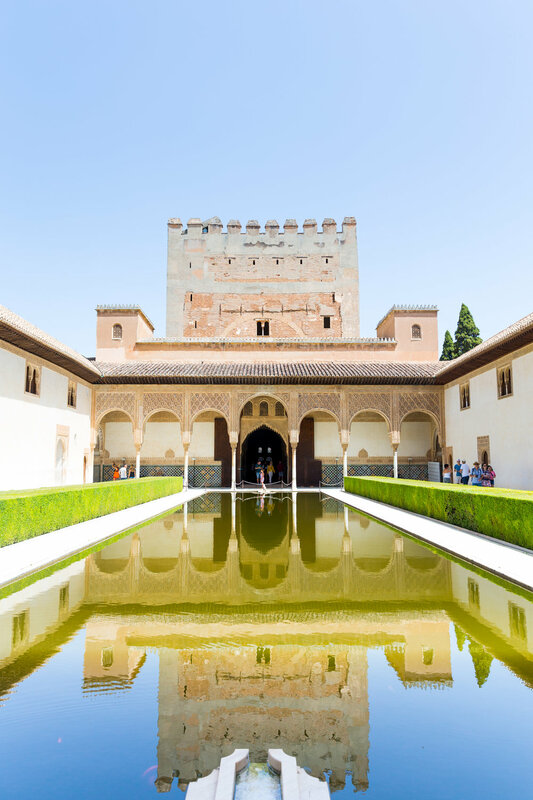 The Alhambra was actually very impressive--it's a huge palace and fortress built for the Moorish Emirate of Granada in the mid-13th century. After the Christian reconquest, the palace was the site of the Royal Court of Ferdinand and Isabella, where Christopher Columbus received endorsement for his infamous expedition. As beautiful as the site is, though, it is crowded with tourists lining up in droves to visit. It felt a little like Disney world with groups pushing past left and right. But it was certainly beautiful and I especially enjoyed walking through the extensive gardens. After our tour we stopped for lunch in a nearby town then made the long journey back to the ship. Our final stop was in Palma de Mallorca, which wound up being one of my favorite places on the trip. The city is chic and glamorous, and the whole island is known for attracting billionaires and celebrities from all around the world. We did a little shopping and perused Palma, then grabbed a cab and went to a nearby beach area, but it was so hot we just found a place for lunch, ate, then headed back to Palma. In Palma, Windstar hosted their Destination Discovery Event, which was a performance of traditional Mallorcan dancers and tapas on the terrace outside a modern palace in the center of the city. The cruise ended in Barcelona and though we chose not to do an excursion, we had a fun time just exploring the Gothic quarter and some of the places that a guide on the ship had recommended to us. All in all, we had a great time exploring the coasts of Portugal and Spain with Windstar and making some great new friends along the way. Like I said, the ship is relatively small, and the one were on in Tahiti was half the size of our European ship, named the Star Breeze. The Star Breeze is not a sailing ship like many of those in the Windstar fleet and because it is larger it holds 212 guests in spacious rooms, some with balconies. We had the most basic room type and still found it very roomy, with a living room area and a bedroom area easily separated by a curtain, a closet, and a bathroom with double vanity. We spent very little time in the room but when we did it was comfortable. Breakfast, lunch, and dinner are served in two dining rooms and there are always several options to choose from for each course, including a vegetarian option. The dining staff is so friendly and by the end of the journey we felt like we'd befriended most of them. There is a spa and a fitness center on board, though let's be honest, I only went to the spa. People who work out on vacation impress me, but not enough to actually do so myself. I got a relaxing massage and my mom got a massage and pedicure. There are several open decks for lounging, a pool in the center of the upper deck, and even a hot tub at the front of the boat. The biggest drawback I found that can in no way be helped was the spotty and nearly non-existent wifi access. The ship offers wifi through two satellites but when we were at sea and even often when not, it was hard to get a signal. You can also check out some of my photos from my time on my Tahiti Windstar cruise here, here, here, and here!